Shrimp has become a popular purchase for American consumers, with U.S. consumption of shrimp reaching 3.8 pounds per person in 2012. Demand for shrimp has increased over the years, and shrimp is currently the largest imported seafood species, accounting for 29 percent of seafood imports by dollar value. In 2013, consumers and businesses found themselves paying higher prices with less product available in supermarkets and restaurants. For example, the popular restaurant chain Red Lobster recently saw a 35-percent increase in the price the company paid for shrimp. The price hike contributed to a 3.1-percent increase in the company’s overall food costs and, more recently, an 18-percent decrease in earnings during the quarter that ended in February 2014. Similarly, Noodles & Company noted that the cost of shrimp in its pasta dishes would rise 29 percent this year. The reason for the higher shrimp prices is a shortage of imports from the top shrimp producers in Southeast Asia. With about 90 percent of shrimp consumed in the United States coming from imports, any change in foreign supply affects both U.S. import prices and overall consumer prices. ... A large contributor to the seafood price increases was a disease-related decline in supplies from the top three shrimp-producing countries: Thailand, Vietnam, and China. 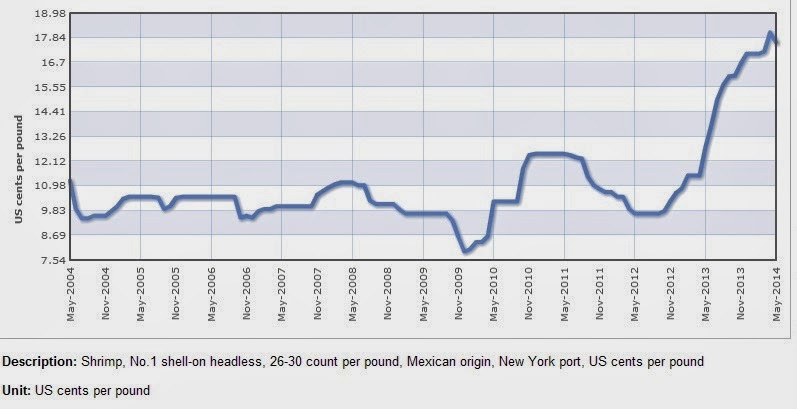 Here's the pattern of U.S. shrimp prices over the last 10 years from the Index Mundi website, based on price data collected by the International Monetary Fund (as part of its data on "primary commodities"). The more modest price rise for shrimp back in 2010 apparently reflects, according to Reed and Royales a previous outbreak of shrimp diseases in other countries, together with the effect of the Deepwater Horizon oil spill on shrimpers in the Gulf of Mexico. 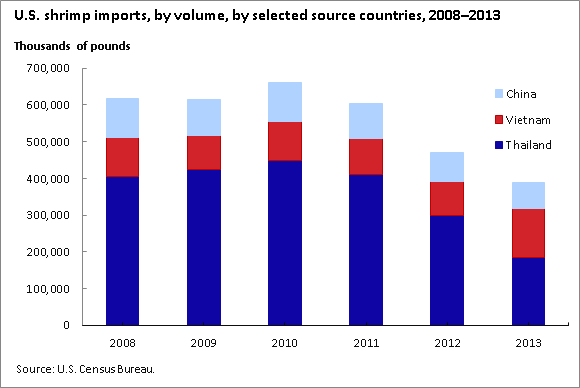 Here's a figure from the Reed and Royales showing quantities of U.S. shrimp imports from China, Vietnam, and Thailand. 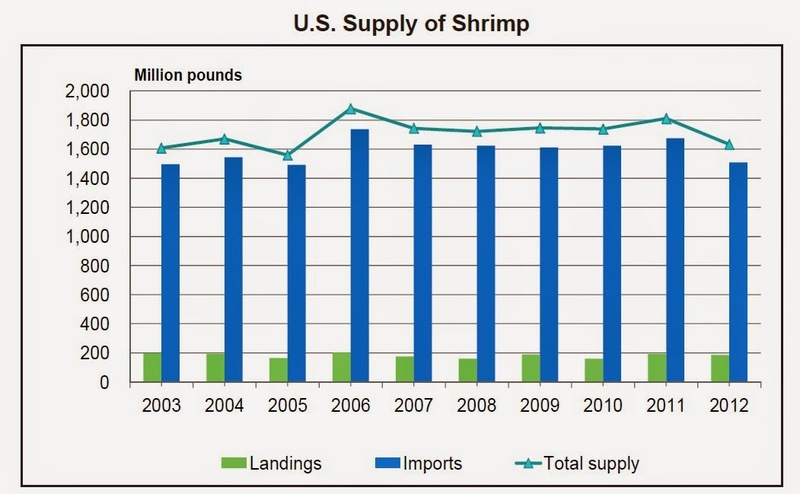 For context, here's some data on overall US shrimp supply from the National Marine Fisheries Service at NOAA. The most recent data available here only go through 2012, and so only show the start of the supply drop-off. There's an old rule for holding a successful friendly dinner party: never seat two economists beside each other. 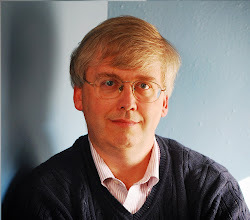 But if you draw the short straw and end up sitting next to an economist when you're out for a nice seafood dinner, feel free to discuss diseased Asian shrimp, oil spills, and the resulting price fluctuations. The economist will regard it as normal meal-time conversation.